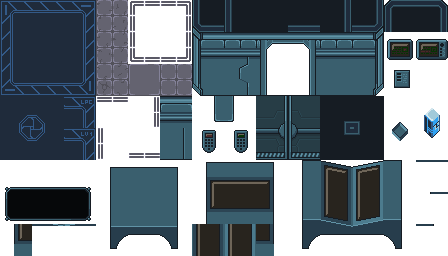 Heavily inspired by, palette taken from, and a few pixels copied from Space Scifi Rpg Tiles 48x48 by Hyptosis. The energy crystal is from Sci-Fi Blue Pillar by FunwithPixels. 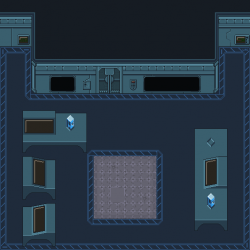 The table is from and the computers are based on [LPC] Skorpio's SciFi Sprite Pack by Skorpio. Energy crystal and table got both adapted to the new palette. Embedding a crystal into a table is based on an idea of Psychronic. Contains a small energy crystal meant as inventory item.